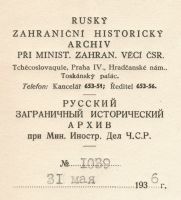 The Russian Historical Archive Abroad (Russkii zagranichnyi istoricheskii arkhiv - RZIA) was founded in Prague in 1923 upon the initiative of representatives of Russian émigrés living then in Czechoslovakia. Its activities were financed from a fund set up by the Czechoslovak government to assist emigrants from Bolshevik Russia and the Soviet Union. The Archive was acquiring books, journals, newspapers and archival documents pertaining to Russian revolutionary movements, the revolutionary year of 1917, Russian civil war and consequent development in the Soviet Union, and primarily to the Russian emigration. During its existence the Archive became a world-wide unique resource not only for its scope but mainly for its quality. In 1928, due to financial problems, the Archive was transferred to the Czechoslovak Ministry of Foreign Affairs, which became its owner. During the WW II the Archive was integrated into the archival structure of the Ministry of the Interior. In 1945, the Archive was closed down. Upon a proposal made by the communist minister Zdeněk Nejedlý the archival part of the collection was handed over to the Soviet Union. One part of the collection that stayed in Czechoslovakia was a registry of the Archive containing a comprehensive collection of administrative documents. This collection incorporates documents from 1923 to 1946 and is divided into several main sections. The first one includes essential documents that define legal status of the Archive during its existence, annual reports and multitude of minutes from meetings of various committees and boards. There are also extensive personal data of the staff, documents outlining activities of individual departments and correspondence with agents who acted on behalf of the Archive all over the world. The largest section of this collection is a correspondence with individual persons. It was split into two parts based on the subject matter. It contains correspondence with over 2000 people living literally across the world. Even though the letters deal mainly with official matters, such as acquisition of documents, handing them over or selling them to the Archive, they helped at least partially to complete biographies of many émigré personalities. There is also an extensive correspondence between the Archive and various institutions. An interesting knowledge may be gained by study of the RZIA activities during the WW II. Aside from forms confirming Aryan origin of the staff members and numerous permits issued to researchers, there are materials from which it was possible to reconstruct workings of individual departments and fate of their staff. Documents pertaining to regular day-to-day work and administrative activities, to various cultural and publication endeavors and to financial management are stored separately. A constituent part of the collection is 44 administrative books – mostly acquisition lists. One of the volumes is notable as it contains clippings from the period press about the Archive. The catalogue of the collection was published in a book form and contains as well a register of administrative documents of RZIA housed in the State Archive of the Russian Federation in Moscow (coll. R-7030, inventory no. 1). For more information see here. The collection in the Slavonic Library was sorted out, stored and made accessible thanks to the project called “The internal archive of the Russian Historical Archive Abroad. Processing, storage, cataloguing and accessibility of the unique collection of documents” (reg. no. 409/07/0766) supported by the Grant Agency of the Czech Republic. To the scholars interested in the full picture of RZIA we recommend a study of smaller collection housed in the archive of the Ministry of Foreign Affairs of the Czech Republic and in the Czech State Archive. Attention should also be paid to the above mentioned collection in Moscow.